I didn’t know that we have a Goodwill outlet store here in Denver until one of my friends told me about it. I was really excited to visit the place because it’s only .79 per pound. Last week we planned on going there and good thing we didn’t have any plans for afterwards. I told my hubby that I can’t bring our daughter to this place because I can’t concentrate on shopping. Lately she doesn’t want to stay long in any store and always bugs me to go home. So, my friends shopped for over three hours and was so happy because we found some great stuff. One of the nice items that I bought was this crocs shoes for kids. 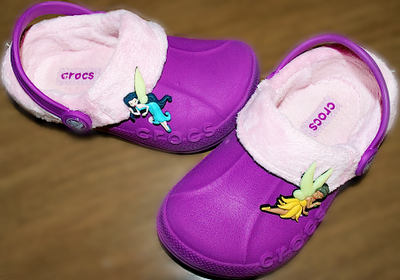 Our daughter has been asking me to buy her a pair of purple crocs, but she didn’t know I was already looking to find them on sale. I was so happy when I found a pair at Goodwill and they still looked pretty new. I was excited to go home and wash them so I can show them to my princess.